The original redan hole is the 15th hole at North Berwick Golf Club in Scotland, designed by Ben Sayers. Many consider the redan as the best par 3 design in golf. I think it’s a phenomenal design because of the options it gives golfers of different skill levels. Birdies, pars and big numbers can be had by great players and average players alike. Redan holes typically range from 180-215 yards and feature a 45 degree right-to-left angled green that is protected by a deep bunker that runs along the left side of the green. Redan and reverse redan (same concept except they are angled left to right) greens carry a great deal of slope that typically runs towards the bunker and from the front of the green to the back of the green. An easy way to spot a redan is by their defining shoulder or hump on the right side of the green, which will help funnel balls towards the middle of the green. Traditional redans also typically feature a short bunker and a bunker behind the sloping shoulder to penalize wayward shots. If you find the back bunker, a par save is highly unlikely. A player’s strategy on redan holes will be determined by skill and their preferred shot pattern. A highly skilled player who plays a draw will love these holes as they will be able to shape a shot to a pin effortlessly. For less-skilled players or players who hit a left-to-right shot, the hole becomes quite tricky. The obvious bailout position is in the short and right of the green, but that will leave a challenging pitch that is heavily influenced by slope. The best place to bail is long and left which will leave an uphill chip back to the pin. Let’s take a look at examples of redan holes at both classic and modern designs. The Original Gangster, the 15th at North Berwick is where Macdonald and so many other architects drew their inspiration. North Berwick’s redan will set the tone for all of the other versions you will see later in this piece. The green slopes heavily from right to left and front to back and is guarded by extremely deep bunkers on the left side as well as long and right. An ideal miss is long as it leaves an uphill chip shot back to the pitched green. From the right of the green at North Berwick's 15th. Photo Credit: North Berwick Golf Club. The 7th at Macdonald's Chicago Golf Club stretches to 207-yards and calls for a precise long iron shot that moves from right to left. A shot that lands on the right shoulder will funnel back to the middle of the green. The seventh at Chicago Golf's one of the most pronounced and severe redan holes of those listed. Some consider it the best rendition of the hole in the world. The tee shot to the 7th at Chicago Golf Club. Photo Credit: Chicago Golf Club. From the right side of the 7th. Those that don't think Chicago Golf's is the best, consider NGLA's the the greatest redan hole in golf. Macdonald many bold features into the 4th at NGLA, including a large right to left slope and an extremely deep bunker, forcing even the best players to bail right. Designed by Seth Raynor, the 14th is a dramatic redan hole as evidenced by the deep bunker guarding the green and the large shoulder along the right side. This redan hole is unique because of the ravine that Raynor was able to use as an added penalty for a left shot. The 14th hole at Shoreacres, designed by Seth Raynor. As you can see, a shot played short and to the right leaves a player with an awkward chip shot that will be heavily influenced by the shoulder on the right. A poor shot runs the risk of rolling into the greenside bunker. A look at the redan green at Shoreacres. At Fox Chapel Golf Club outside of Pittsburgh, Raynor employs a reverse redan for the 6th hole. The hole mirrors the 14th at Shoreacres except the green angles from left-to-right rather than right-to-left. Seth Raynor’s Cincinnati classic has one of the best redan holes in golf, the 15th which stretches to 192 yards. Notice how well Raynor is able to use Camargo’s rolling terrain to his advantage, blending the 15th hole perfectly into the natural terrain. The miss long and left is quite dicey here. A look at the back of the 15th green at Camargo. At C.B. Macdonald’s Saint Louis Country Club, you will find another reverse redan on the 16th. While Macdonald always preferred a right-to-left redan, here the natural terrain called for a left-to-right sloping green. This redan’s slope isn’t quite as pronounced as some of the others but is a splendid design that requires a player to execute a left-to-right shot to get the ball close. Behind the redan at St. Louis C.C. The 7th at C.B. Macdonald’s Sleepy Hollow is a beautiful downhill reverse redan that plays a stiff 217 yards. While this redan’s shoulder isn’t as pronounced as others, it makes me think it may play tougher in today’s modern era as the back left bunker is much more in play. A shot from there is very challenging to get up and down. Site of the first U.S. Open and U.S. Amateur, Newport C.C. is one of the most historic golf clubs in all of America. Here we will see our first redan hole not designed by Macdonald or Raynor, as Newport's course was designed by William Davis their first club pro and later renovated by the legendary A.W. Tillinghast. The 14th at Newport C.C., one of America's first golf clubs. The redan at C.B. Macdonald’s only public access course is a dandy. The photo below shows the natural topography made for an ideal redan site. A wise player will keep their shot towards the right as the green is guarded by the deepest bunker on the course. Old White's redan is one of the few that plays to the original intention of the hole with its yardage which requires a low running shot. 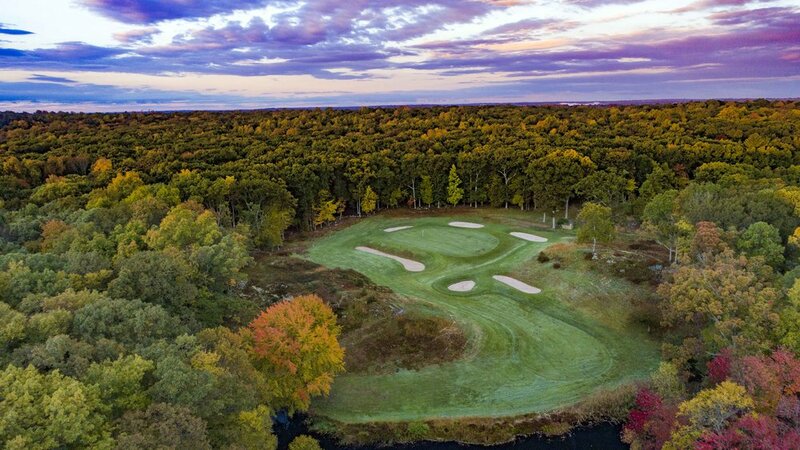 An aerial look at the redan at Old White Photo Credit: Josh Pope. A little history lesson goes along with this one. After C.B. MacDonald designed the neighboring National Golf Links, he and Seth Raynor were enlisted to redesign Shinny. The course was then redesigned again by William Flynn, who removed many of MacDonald and Raynor’s changes, one that stayed was the redan hole. Flynn did alter the green raising it, which made it more severe than it's original self. This hole is nasty thanks to the tee box being moved right. The green has heavy slope from front to back and requires perfection in order to succeed. The 7th green from the 8th tee box. Seth Raynor’s seaside masterpiece, Fishers Island, features a redan hole early in the round. This one is a bit shorter than a typical redan hole and has the added water element short of the green to play with a player’s mind. More on Fishers Island Club. Fishers Island also has a two-shot redan. The par 4 12th, features a reverse redan that makes for a vexing short par four. Players have to approach the challenging green complex from a miriad of uneven lies. The green complex also features a subtle knoll in the back half that creates a small added challenge. More on Fishers Island Club. The 13th at Yale is a beautiful downhill redan at one of Seth Raynor’s best designs. At 213 yards, it still calls for a relatively long-iron approach but the downhill makes this redan play a little bit shorter. The tee shot at the redan 13th at Yale. Yale is also home to a two-shot reverse-redan, the short par 4 11th. The downhill tee shot forces a decision, layup short of the fairway’s center roll or hit driver over it. Laying up short leaves a shot of over 150 yards while an aggressive driver leaves an awkward short wedge shot to the fallaway green. Players who find the roll in the fairway will face a lie on an upslope or downslope. The 11th at Yale is a wonderful strategic golf hole that is often overlooked. 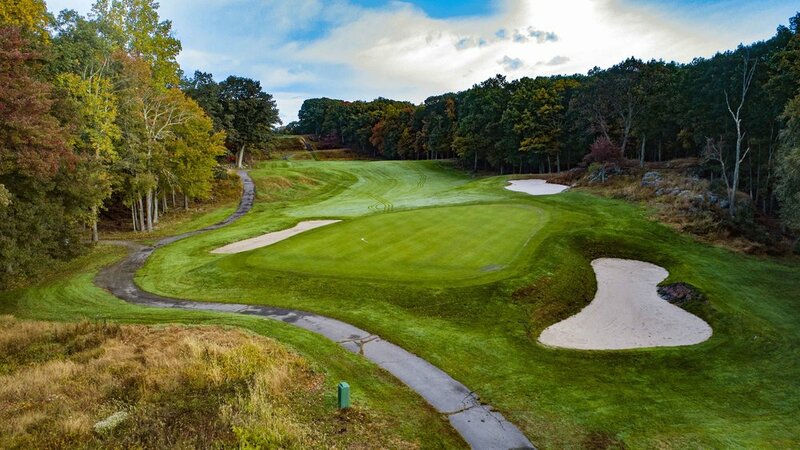 Macdonald built a beautiful reverse redan at Long Island’s The Creek Club. A good mid-iron shot requires a player to hit a high cut to the left to right sloping green. Raynor's redan at Lookout Mountain. The redan from Seth Raynor’s beautiful Florida course Mountain Lake. The 8th at Mountain Lake features a dramatic sweeping right to left slope that influences shots hit on the right side of the green. The slope of the 8th has to be seen to believe its truly remarkable. While the 8th at Mountain Lake is shorter than your typical redan hole its bold shaping makes up for it. Lots of slope in Mountain Lake's Redan. Tom Doak and Jim Urbina's take on the redan at Bandon Dunes’ C.B. Macdonald tribute course has a bit of a twist on the traditional version. 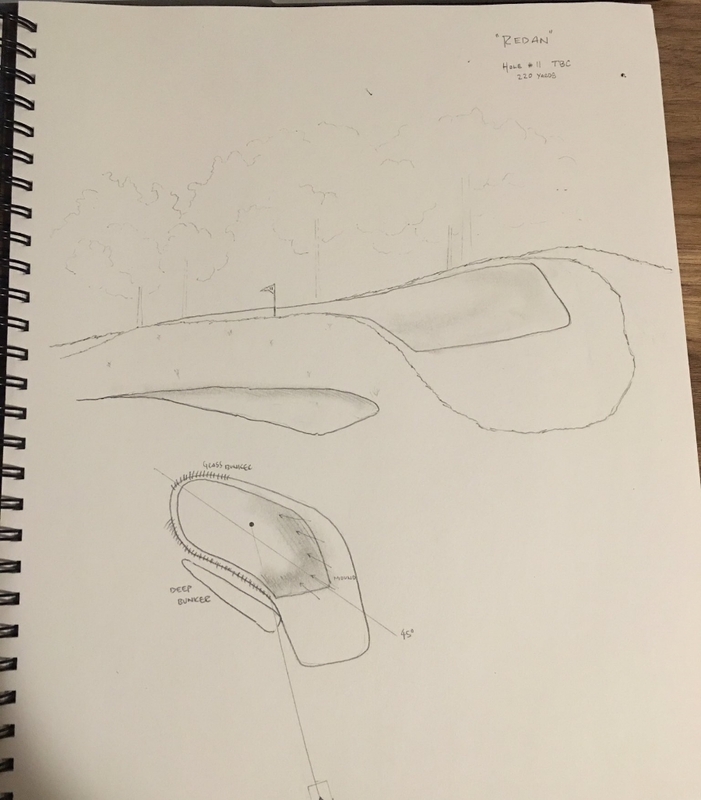 The 12th plays from a longer yardage to accommodate for modern technology and features a smaller bunker on the left side. A snippet of Doak’s full description can be found here. One of the best Seth Raynor designs is the exclusive Yeamans Hall in Charleston, South Carolina. Here is a look at their redan hole, the sixth that has an extremely nasty back left pin position as featured here. A fine representation of the redan template is at the oft-overlooked Southampton Golf Club. The club flies under the radar thanks to its high-profile neighbors NGLA and Shinnecock Hills. What makes Southampton's redan hole is the bold slope from right to left and front to back. Looking back at Southampton Golf Club's 7th. 1st tee shot at Raynor's Blue Mound. The approach to the 1st at Blue Mound. A look from left of the green. The tee shot to Blue Mound's 13th. A look at the 13th green from the 12th fairway shows the great slope. The bold Charles Banks design in Emerson, New Jersey features a wonderful redan hole. The 11th has big features that Banks and his steam shovel were known for. Until recently the tremendous kicker slope on the right was buried under rough. Designed by Brian Silva, the Black Creek Club features a reverse redan that stretches to 239 yards. Silva wanted the 7th at Black Creek to play like Macdonald’s original intention in the early 1900’s, requiring players to run the ball up and utilize the slope of the redan to hit the ball close. This is an extremely difficult and absolutely beautiful reverse redan. 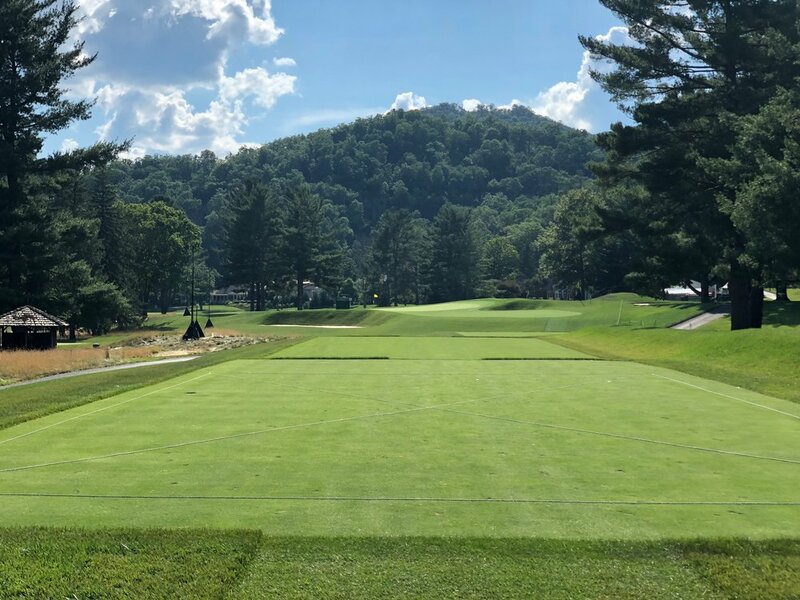 Silva’s Chattanooga gem also features a traditional redan hole that has all original features: 3 bunkers, one short, a deep left bunker and a long right bunker, along with a heavy right to left sloping green. A Charles Banks design, Forsgate has a ton of great template holes including the 7th, their redan hole. The 7th is a reverse redan, and I like the yardage it’s played at because it requires players to hit an accurate long-iron shot (Macdonald’s original intention). The George Thomas masterpiece features an incredibly difficult reverse redan. Stretching to 244 yards from the back tee box the 11th plays slightly downhill but the long shot, deep bunkering and sloping green make par a tough score to come by. The redan finisher at Cavalier, a Charles Banks design in Virginia Beach, is unique as Banks brought a water hazard into play. Unlike most redan holes, players do not want to miss long or left on the 18th, making the hole all the more challenging. 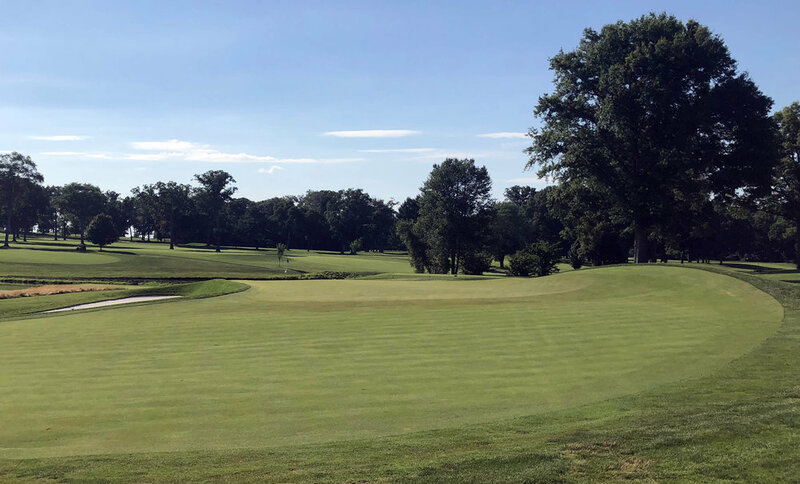 When Keith Foster was hired to restore Philly Cricket, he removed a lot of trees from the 15th and some yardage to make Tillinghast’s redan 15th play like its original intention. Playing at 240 yards, the 15th requires players to hit a long-iron, hybrid or fairway wood into the green. To hit a good shot you likely will need to land the ball short and run it up. The long 240 yard redan at Tillinghast's Philadelphia Cricket Club. A look at the slope from in front of the 15th. Old Macdonald isn’t the only course at Bandon Dunes that features a redan hole as Tom Doak employed the design on the 17th hole at Pacific Dunes. 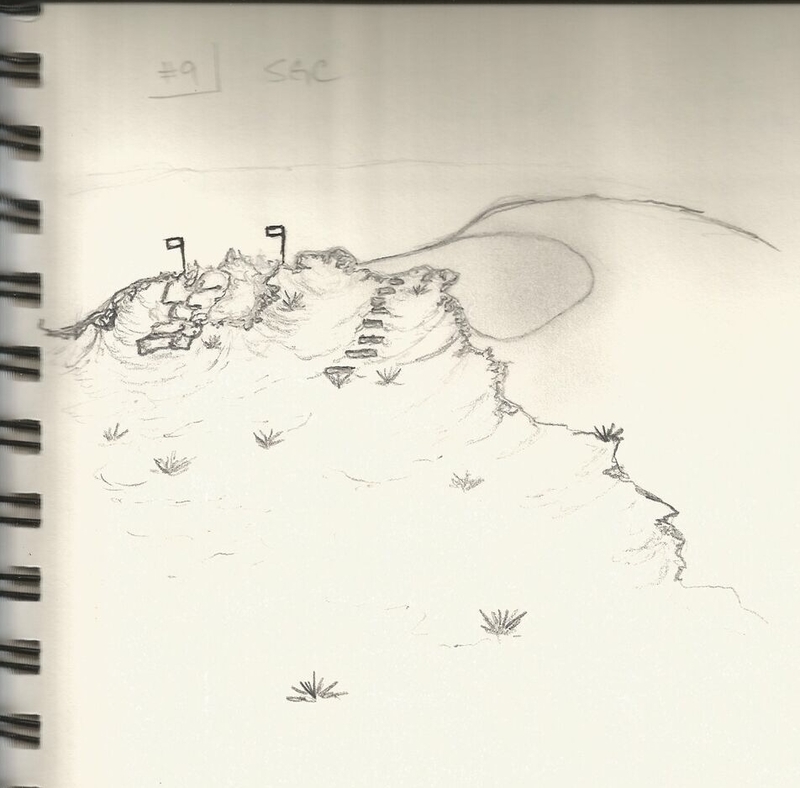 A tough one-shot hole on the closing stretch makes a player navigate an downhill target that’s heavily protected by a deep bunker. Here’s a look at how Rob Collins, a modern architect, is still using these templates in his design 100 years later. The 9th at Sweetens Cove is a hybrid of two of Macdonald’s template holes, “the redan” and “the short.” As you can see, the redan features are unmistakable as a giant shoulder rests on the right side of the green, allowing players to bank shots off it towards the pin. The 9th at Sweetens Cove, designed by Rob Collins. A look at the extreme redan sloping from the right side of the 9th green. Sweetens Cove's 9th has a dramatic slope to its redan. A view from the left side of the green. View from the left of the 9th green at Sweetens Cove. Coore and Crenshaw use the redan heavily in their designs. They feature a pronounced redan hole at their newest project, Sand Valley. Here’s a look at the 3rd hole, which features a massive shoulder that will kick balls to the center of the green. I missed right of it, not recommended. Coore and Crenshaw's redan at the new Sand Valley. Playing off the right mound can lead to great reward, but if you miss it you are left with an extremely challenging shot. A slight difference from the Macdonald & Raynor versions that you will see in Coore & Crenshaw’s version here is a less-sloped green from front to back. The view of Sand Valley's 3rd from the back of the green. Located in Northern Michigan and designed by Michael DeVries is the Kingsley Club, which features a redan par 3 on the 16th hole. DeVries adds a twist to the original design with two bunkers behind the green to add penalty to a shot that misses long. The original site of Macdonald’s first course Chicago Golf Club, Downers Grove Golf Club has 5 of the 9 original holes still intact. Over time, this municipal has allowed the greens to shrink and diminished many of Macdonald’s original designs, but on the 8th, you can still see the distinct redan characteristics. This was the first redan hole built in the United States! The contours remain at Macdonald's first design, now Downers Grove Golf Club. As you can see, the green at Downers Grove Golf Club’s 8th hole has shrunk over time. Hopefully, a restoration will happen and the green will move back to the right and the bunker guarding will be deepened. Considerable work needs to be done expanding the green to its original size and renovating the bunkering. A neighbor of Fox Chapel, Longue Vue Club was not to be outdone with its redan hole, designed by Scottish golf professional, Robert White. What I love about this redan is the way White was able to carve the hole out of the natural terrain. All of the land flows right to left and downward, which gives this redan a beautiful natural feel. The 3rd hole at Pittsburgh's Longvue Club. The historic George Thomas design features a beefy redan hole, the 4th that requires players to hit a precise long iron shot into the severely sloped green. To make matters worse for players, this hole usually plays into a sea breeze. Due to its length, the 4th at Riviera plays like the original intention, forcing players to land it short and run the ball up to the green. The 4th hole at the Riviera Country Club. Ben Hogan called the 4th at Riviera "The Greatest Par 3 in the world" a statement which is hard to disagree with. Here is a look at the green. A look from behind the 4th hole at Riviera. Do you have a redan hole that should be added to this list? Send us a note here.